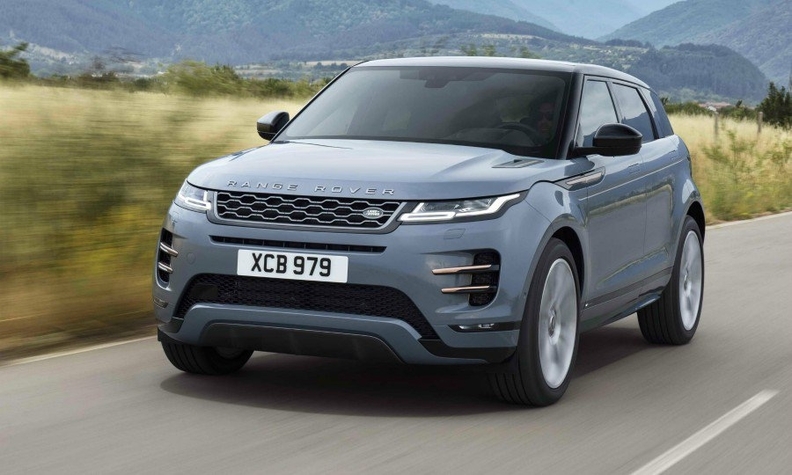 Land Rover calls the second-generation Range Rover Evoque a “sophisticated evolution” of its smallest model, which has accounted for 772,096 global sales since its 2011 debut. Because 73 percent of Evoque customers live in urban areas, Land Rover refined the original proportions, adding a more refined surface treatment derived from the larger Velar -- creating what exterior design director Massimo Frascella calls an “urban jungle” look. The new Evoque is built on an update of the current model’s steel platform that parent Jaguar Land Rover now calls the Premium Transverse Architecture. It has the same 4370mm length, but a 21mm-longer wheelbase offers 20mm more legroom to rear passengers. Also, cargo space has grown 10 percent to 591 liters, yet remains one of the smallest in the SUV’s class. Limited loading capacity seems not to be an issue anyway, because 70 percent of Evoque buyers have no children, the company said. Engines: The Evoque will be offered in Europe with four-cylinder, 2.0-liter engines that deliver 150, 180 and 240 hp for the diesels and 200, 249 and 300 hp for the gasoline engines. Technology: Ground View makes the engine hood invisible by projecting camera imagery onto the upper touchscreen to show the driver a 180-degree view under the front of the vehicle. The feature is useful not only when driving off-road but also when negotiating difficult parking spaces and navigating high city-center curbs. The system combines the images of three cameras -- one in the center behind the grille and two housed in the side mirrors. To improve rear visibility, the new Evoque has a rearview mirror, called ClearSight, that uses a high-definition camera mounted on the roof inside the antenna fin. ClearSight displays what is behind the vehicle in high definition, even when rear visibility is compromised by passengers or bulky items. The screen provides a wider, 50-degree field of vision and superior visibility in low light. About 90 percent of Evoque sales are expected to be models with some sort of hybrid electrification. Only variants equipped with manual transmissions and front-wheel drive will have just a non-electrified internal combustion engine. At launch, the Evoque’s all-wheel-drive versions will come standard with a 48-volt mild hybrid that adds a belt-driven starter-generator to capture energy lost in braking and provides electric assistance during acceleration. Land Rover said this mild hybrid on average will slash fuel consumption by 6 percent and CO2 output by about 8 grams per kilometer. The most fuel-efficient mild hybrid diesel version of the new Evoque offers CO2 emissions of 149g/km, Land Rover says. By the end of the year, the Evoque will add a 300-volt plug-in hybrid with an electric motor mated to a new three-cylinder, 1.5-liter gasoline engine expected to reduce CO2 emissions to below 45g/km, the company said. Land Rover dropped the Evoque’s three-door version after demand fell to about 3 percent of total volume.